This bulletin features visuals focusing on conflict trends mapped during the second third of 2017. It also highlights a selection of the latest publications on the project’s page, including papers, articles, reports, visuals, and interactive content. Going beyond the view of conflict through a security framework associated with belligerency and violence, Lebanon Support upholds that conflict is of a socio-political nature. It thus sheds light on dynamics underlying a broad spectrum of violent and non violent contentions including social movements, conflicts opposing minorities (ethnic, religious or sexual among others) as well as local, national or regional actors’ policies. ● The number of incidents mapped in May-August 2017 increased by 22% compared to the first third of the year. 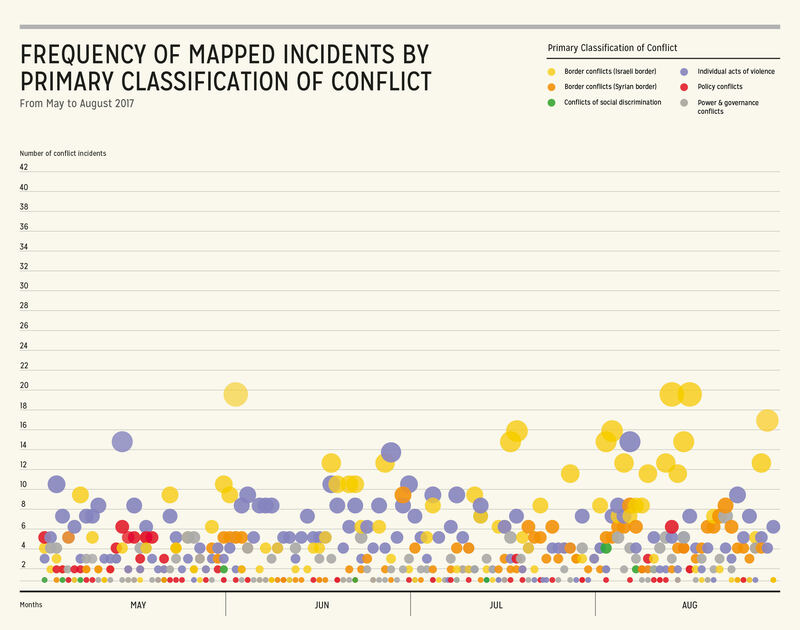 ● Arrest/detention and air space violation are the most mapped primary categories of incidents during this period. ● The Israeli Military is the most active state actor on the Lebanese territory. ● The number of incidents involving Syrian civilians/refugees (235 incidents) has significantly increased by 34% compared to the first third of the year, with more than half of the incidents categorised as arrest/detention. ● The incidents relevant to Border Conflicts with Syria have more than tripled during this period compared to the first months of 2017. ● This period witnessed a significant drop by 47% of incidents classified as Policy conflicts compared to the beginning of the year. The second third of 2017 witnessed a total of 1,795 incidents, which is an increase of 22% compared to the 1,476 conflicts mapped during the first months of the year. The conflicts mapped between May and August 2017 appeared to be dispersed across the country with 250 locations recorded during this period. However, 57% of mapped incidents are concentrated in 5 cazas, and represent together a total of 1,022 incidents: Baalbeck (350 incidents), Sour (257 incidents), Saida (173 incidents), Beirut (140 incidents), and Baabda (102 incidents). In Baalbeck more than half of the conflicts are related to Border Conflict with Syria. Also, 79% of incidents mapped in Sour were classified as Border Conflicts with Israel, with recurrent airspace violation and sea border crossing/violation by the Israeli Military. 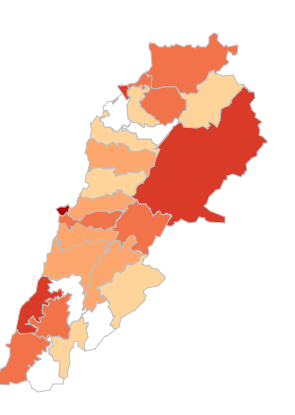 Moreover, the majority of incidents mapped in Saida are classified as Individual Acts of Violence mostly relevant to arrests, brawl/disputes, shooting, robberies etc. Finally, in Beirut and Baabda 25% of the incidents were classified as Power And Governance conflicts mainly involving illicit trade. The most mapped primary categories between May and August 2017 are arrest/detention (441 incidents), and air space violation (424 incidents). These two categories represent almost half of the total mapped incidents during this period. 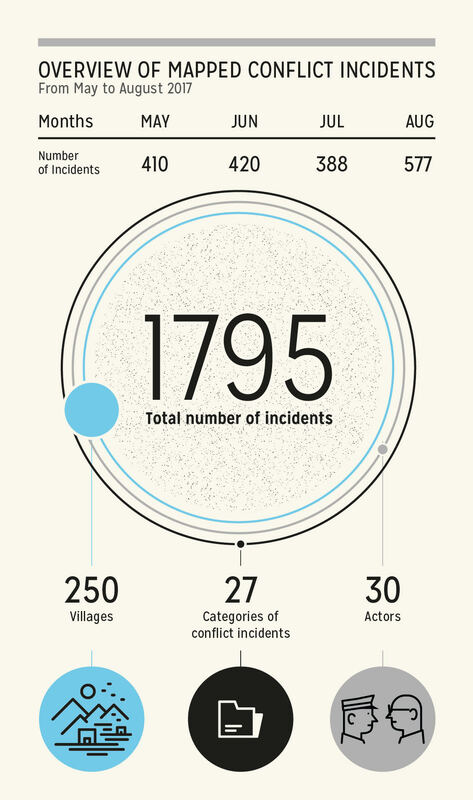 They are followed by collective action (143 incidents), raids (112 incidents) and heavy artillery (112 incidents). It is also noteworthy to point out that the trend for the top three most mapped primary category incidents is the same as for the first months of 2017. Furthermore, among the incidents categorised as arrests, 144 were assigned the secondary category of illicit trade, with 67% of them related to drugs (67 incidents). Also, 11% of arrests included Lebanese State apparatuses foiling human smuggling operations from Syria. For instance, on July 22nd, the ISF Intelligence Branch arrested in Dahr el-Baidar 55 Syrians smuggled illegally into the country as well as their smugglers. Besides, the number of arrests due to militant funding and support have increased during the second third of 2017 compared to the first months of the year (3 incidents) with 9 incidents related to the smuggling of fuel, food, or money to militants or terrorist groups. In addition, the number of incidents categorised as heavy artillery have almost tripled between May and August (112 incidents) compared to the beginning of the year (36 incidents). 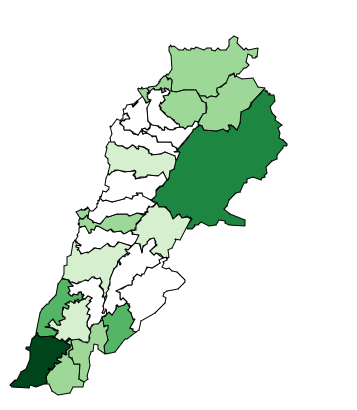 In fact, Lebanon has witnessed during this period three main armed clashes located in Arsal between Hezbollah and Jabhat el-Sham (previously al-Nusra), in Ras Baalbeck between the Lebanese Armed Forces (LAF) and Islamic State (see the third visual below for more information on Ras Baalbeck), as well as in Ain-el Helweh between Palestinian factions. Finally, the number of gender based violence conflicts reported almost doubled (17 incidents) during this period compared to the beginning of the year (10 incidents). In fact, 6 prostitution rings have been identified and dismantled in only 4 months by Lebanese authorities. For instance, on May 27th, police arrested a prostitution ring as well as their kingpin around Sahel el-Alma area. Also in Zahle, on June 22, four people were arrested on charges of connections with a prostitution ring. However, it is important to point out that gender based violence incidents remain under-reported in Lebanon, especially those relevant to domestic violence or sexual abuse. The main mapped actors can be separated into two groups: state apparatuses and civilians. The first one includes state security actors such as the Internal Security Forces (ISF), Lebanese Armed Forces (LAF), General Security, State Security, but also foreign state apparatuses such as the Israeli military. In fact, the latter is the most active state actor involved in no less than 531 incidents. It is followed by ISF (357 incidents) and LAF (202 incidents). The second group includes civilians/refugees such as Lebanese, Syrian, Palestinian, and Turkish citizens among others. Similar to the first months of 2017, Lebanese civilians (524 incidents) remain the most mapped actor in the second group. However, it is interesting to note that the number of incidents involving Syrian civilians/ refugees (235 incidents) has significantly increased by 34% compared to the first third of the year (175 incidents). Also, more than half of the incidents involving Syrian civilians/refugees are categorised as arrest/detention. These figures highlight a general trend in increased policing and securitisation targeting refugee populations in Lebanon, in a context of heightened security threats, and media and political discourse scapegoating refugees. Besides, 41% of the incidents involving Palestinian civilians/refugees are located in Ain el-Helweh which witnessed an escalation of violence during the month of August, with armed conflicts between Palestinian factions involving gunfire, explosions, and heavy artillery. Finally, other groups of actors such as political parties as well as armed militants and factions have been involved in different conflicts across Lebanon. For instance, the number of incidents involving the Islamic State has doubled during this period compared to the beginning of the year, with the majority of incidents located in Arsal and Ras Baalbeck outskirts where these groups have been operating. Similar to the beginning of the year, Individual Acts of Violence (588 incidents) and Border Conflicts with Israel (563 incidents) have been the most mapped primary classification during the second third of 2017 . Focusing on Individual Acts of Violence, 34% of these conflicts are relevant to arrests (202 incidents) and 17% to brawls/disputes (101 incidents), with most of them evolving into shootings (76 incidents). This trend comes in a context where widespread use of weapons has been denounced by civil society groups and activists. The number of incidents classified as Border Conflict with Syria (286 incidents) has more than tripled between May and August compared to the first third of 2017 (92 incidents). This increase could be explained by several LAF operations conducted against armed militants during this period. One of them took place at the end of June when 5 Jihadi militants blew themselves up during Army raids in Arsal which led to the intensification of LAF operations on Syrian refugees camps. In fact, 50 raids or arrests related to Syrian Border Conflicts were mapped afterwards in July and August. This number is still less than the 63 similar incidents recorded during the same period last year after el-Qaa bombing at the end of June 2016. The most notable border conflict incident remains the “Fajr el-Jurd” operation during August in Ras Baalbeck outskirts, in which the Lebanese Army led an offensive in order to expel Islamic State militants from Lebanese territories (see the third visual below for more information on Ras Baalbeck). Moreover, a similar operation against Jabhat el-Sham (previously al-Nusra) was conducted by Hezbollah earlier in July in the Arsal outskirts. 82% of Syrian Border Conflicts are also classified as Power and Governance as they involved armed militant groups such as IS and Jabhat el-Sham and threatened the central state’s power and governance. Also, it is noteworthy to point out that 23 incidents related to Border conflicts with Syria were also classified as Conflicts of Social Discrimination with Army raids on refugee settlements which is consistent with the trends at the beginning of 2017 (22 incidents). However, these incidents are concentrated in three months: May, June, and July. Furthermore, the second third of 2017 witnessed a significant drop by 47% of incidents classified as Policy conflicts, with only 109 instead of the 207 incidents mapped between January and April. All Policy conflicts mapped in the second third of 2017 were relevant to collective actions. In fact, while the first third of the year witnessed a rise of collective actions relevant to the number of laws, reforms, and decisions issued at the end of 2016, the second third of the year appears to be more steady in terms of political decisions which could explain this drop of Policy conflicts. While the visual above shows that no Conflicts of Socio-Economic Development were mapped as primary classification, 35 incidents were actually mapped with Socio-Economic Development as secondary classification. 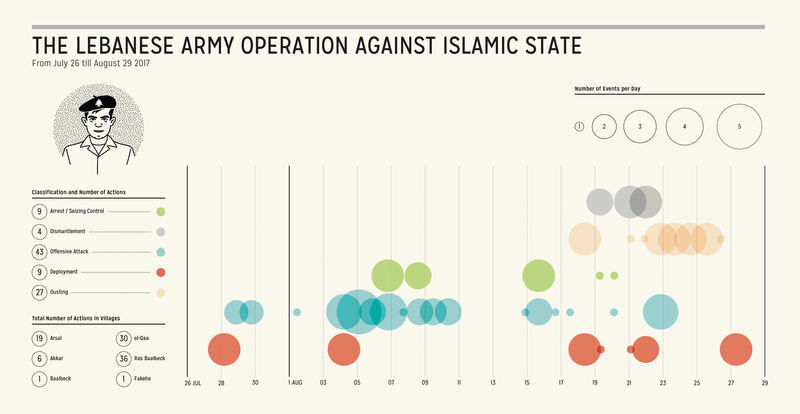 These 35 incidents also represent 32% of the total number of Policy conflicts. These incidents are mainly collective actions involving civilians protesting against unpaid wages, unemployment, unfair competition, but also against public decisions such as law reforms concerning rent or tax policies. Since 2014 clashes in Arsal between the LAF and transnational militant groups, armed militants belonging to Islamic State (IS) have been operating in Ras Baalbeck outskirts. For over 3 years, the conflict in the border region has evolved and escalated into recurring battles between IS and the alliance of the LAF and Hezbollah, but also between IS and Jabhat el-Sham (previously al-Nusra) which had established its stronghold in Arsal. Although these conflicts have been ongoing since 2014, it is not until July 2017 that offensives against these groups were launched in order to seize back occupied territories. In fact, at the end of July, while Hezbollah was launching an attack on Jabhat el-Sham militants in Arsal, the Army was preparing an offensive against Daesh positions in Ras Baalbeck and el-Qaa in order to definitely expel them from Lebanese territory, but also to get information about the fate of the 9 remaining soldiers kidnapped by Daesh during the Arsal clashes in 2014 (see Arsal timeline for more about the abducted soldiers’ case). This operation called “Fajr el-Jurd” (dawn of the outskirts) was officially launched on August 19th and lasted for 10 days. However, the LAF seemed to have been intensifying its operations weeks before the actual launch. While the shelling of militants’ posts has been recurrent but occasional since 2014, on July 26th, the Lebanese army started reinforcing its position in the outskirts of Ras Baalbeck and el-Qaa while heavily deploying around the area. The next day, intensive shelling on militants was reported with heavy artillery, airstrikes, and missiles being used. The armed militants responded to these attacks by targeting LAF positions without causing any injuries among its soldiers. On the 3rd of August, after five days of intermittent clashes, the army began a new deployment around Arsal nearby the Ras Baalbeck area. This deployment also came after the withdrawal of Jabhat el-Sham militants from the region, subsequent to Hezbollah’s offensive. On the same day, intensive clashes were renewed in Ras Baalbeck, el-Qaa, and Arsal, and ended five days later with the Army managing to destroy a number of fortifications and vehicles belonging to IS militants while causing numerous casualties among the latter. During these attacks, the Army was also able to seize control over strategic hills that overlooked IS posts, which played a tactical role during the upcoming last battle. Meanwhile, raids took place in refugee camps in Arsal where those suspected of ties with Daesh were arrested. Afterwards, recurrent attacks continued to be launched for days with the Army bombarding militants’ positions and taking back territories occupied by IS. All these events could be seen as a preparation for the “Fajr el-Jurd” operation that aimed to completely expel IS from Lebanon. From a geopolitical perspective, this battle against IS coincided with parallel attacks led by Hezbollah and the Syrian Army in Qalamoun, on the Syrian side. On the 19th of August, the ousting of the militants officially began with the Army leading an offensive against their posts in Ras Baalbeck and el-Qaa outskirts, and progressively liberating territories occupied by Daesh. This operation was divided into four stages and lasted for 10 days. The first two stages mainly included the intensive shelling of militant groups with heavy artillery and the seizing of occupied territories. Also, following a landmine explosion left by Daesh that killed three Lebanese soldiers during the first day, army units started scanning the areas planted with landmines and explosive device in order to clear the way for the LAF frontline. As a result, the army managed to foil several Daesh suicide attacks as well as dismantle a number of landmines left by the group. By the end of these two phases, military units were deployed in Akkar and the surrounding areas close to the borders in order to prevent militants from escaping towards other regions while a Daesh security official was arrested by the Intelligence unit. Following these preventive measures, the third stage of the operation was ready to be launched on the 4th day of battle and allowed the seizing of strategic strongholds held by IS as well as large quantities of weapons, munitions, and explosive devices left by the militants. On the sixth day of combat, the Army began to prepare for the final stage of the operation by repositioning its posts in the area. On the 8th day, a Daesh attack on an Army vehicle caused 6 casualties among Lebanese soldiers. Meanwhile, LAF units continued to bombard the remaining militants’ posts until a cease-fire was concluded with the group in exchange of the kidnapped soldiers. Despite the apparent victory of the Lebanese Army against these groups, this battle ended on a bitter note with the announcement of the death of the abducted soldiers who appeared to have been killed years ago by their captors. The remains of their bodies were located close to the Syrian borders and retrieved by Lebanese authorities. Finally, on the 10th day, the Army completed its deployment in the formerly occupied area and officially ended the operation, while the military’s expert regiments continued to clear these lands from landmines and other explosive devices. Although incidents in the Collective Action dimension were dispersed all over the country during the first half of 2017, Beirut witnessed the highest intensity in this dimension with 31% of incidents falling in the Collective Action dimension. Additionally, most of the Collective Action incidents mapped in Beirut were classified as Policy conflicts relevant to, among others, Parliamentary elections, rent law, and tax raises. Moreover, in Beirut, 25% of incidents in this dimension were classified as either Conflict of Social Discrimination or Conflict of Socio-economic Development. Read more. Explore all the Conflictivity Index maps and blurbs for the first half of 2017 here. وتتضمّن هذه النشرة رسومات بيانية تُركِّز على اتجاهات النزاعات الممسوحة خلال ثاني أربع أشهر من السنة. كما أنها تسلط الضوء على مروحة منتقاة من أحدث المطبوعات والمنشورات على صفحة مشروع تحليل النزاعات، بما في ذلك الأوراق، والمقالات، والتقارير، والرسومات البيانية، والمحتوى التفاعلي. · ازداد العدد الكليّ للحوادث الممسوحة بين شهري أيار/ مايو وآب/ أغسطس 2017 بمعدل 22 بالمئة مقارنةً بالثلث الأول من هذا العام. · خلال هذه الفترة كانت فئتا التوقيف/الاحتجاز وانتهاك المجال الجوي من أكثر فئات الحوادث الأولية مسحاً. · الجيش الإسرائيلي هو الطرف الحكومي الأكثر فاعليةً على الأراضي اللبنانية. · ازداد عدد الحوادث التي شارك فيها لاجئون/ مدنيون سوريون (235 حادثاً) تزايداً ملحوظاً بمعدل 34 بالمئة مقارنةً بالثلث الأول من العام 2017، مسجلاً أكثر من نصف الحوادث المصنفة في فئة التوقيف/الاحتجاز. · كذلك، تضاعفت ثلاث مراتٍ تقريباً النزاعات المسلحة التي تضمّنت المدفعية الثقيلة مقارنةً بالثلث الأول من العام بسبب الاشتباكات في عين الحلوة وعرسال ورأس بعلبك. (لمزيد من المعلومات المتعلقة برأس بعلبك، انظر الرسم البياني أدناه). · كما أنّ الحوادث المتعلقة بالنزاعات الحدودية مع سوريا تضاعفت أكثر من ثلاث مرات خلال هذه الفترة مقارنةً بالشهور الأولى من العام 2017. شهد الثلث الثاني من العام 2017 ما مجموعه 1795 حادثاً، بزيادة تعادل 22 بالمئة مقارنةً بالحوادث الممسوحة في الشهور الأولى من العام والبالغة 1476 حادثاً. بدا أنّ الحوادث الممسوحة بين شهري أيار/ مايو وآب/ أغسطس 2017 توزّعت في أرجاء البلاد ضمن 250 موقعاً مسجلاً في هذه الفترة. لكنّ 57 بالمئة من الحوادث الممسوحة تركّزت في خمسة أقضية تمثّل مجتمعةً 1022 حادثاً: بعلبك (350 حادثاً)، صور (257 حادثاً)، صيدا (173 حادثاً)، بيروت (140 حادثاً)، بعبدا (102 حادثاً). في بعلبك، يتصل أكثر من نصف الحوادث بالنزاعات الحدودية مع سوريا. كذلك، صُنّف 79 بالمئة من الحوادث الممسوحة في صور في فئة النزاعات الحدودية مع إسرائيل مع تكرار قيام الجيش الإسرائيلي بانتهاك المجال الجوي وانتهاك/ اجتياز الحدود البحرية. علاوةً على ذلك، صُنّفت غالبية الحوادث الممسوحة في صيدا كأعمال عنفٍ فردية يتصل معظمها بالتوقيفات، والمشاجرات/ الاختلافات، وإطلاق النار، وعمليات السلب، إلخ. أخيراً، صُنّف 25 بالمئة من الحوادث في بيروت وبعبدا كنزاعاتٍ على السلطة والحكم، تتضمّن أساساً التجارة غير المشروعة. إنّ الفئات الأولية الأكثر مسحاً بين شهري أيار/ مايو وآب/ أغسطس 2017 هي التوقيف/الاحتجاز (441 حادثاً)، وانتهاك المجال الجوي (424 حادثاً). تُمثّل هاتان الفئتان ما يقارب نصف مجموع الحوادث الممسوحة خلال هذه الفترة. تتبعهما التحركات الشعبية (143 حادثاً)، والمداهمات (112 حادثاً)، والمدفعية الثقيلة (112 حادثاً). من الجدير بالملاحظة أيضاً أنّ الاتجاه السائد للفئات الثلاث الأعلى من حوادث الفئة الأولية الأكثر مسحاً هي ذاتها بالمقارنة مع الشهور الأولى من العام 2017. (اقرأ المزيد حول الفئات الأولية والثانوية هنا). فضلاً عن ذلك، فمن بين الحوادث المصنّفة كالتوقيفات، هنالك 144 حادثاً تخص الفئة الثانوية للتجارة غير المشروعة، ويتصل 67 بالمئة منها بالمخدرات (67 حادثاً). كما أنّ 11 بالمئة من التوقيفات التي قامت بها أجهزة الدولة اللبنانية أحبطت عمليات تهريب البشر من سوريا. ففي 22 تموز/ يوليو، على سبيل المثال، اعتقلت شعبة مخابرات قوى الأمن الداخلي في ضهر البيدر 55 سورياً جرى تهريبهم إلى البلد بطريقة غير مشروعة إضافةً إلى من قاموا بتهريبهم. فضلاً عن أنّ عدد الاعتقالات بسبب تمويل ودعم المقاتلين تزايد خلال الثلث الثاني من العام 2017 مقارنةً بالشهور الأولى من هذا العام (3 حوادث) مع تسع حوادث تتصل بتهريب الوقود والطعام والمال للمقاتلين أو الجماعات الإرهابية. علاوةً على ذلك، تضاعف عدد الحوادث المُصنّفة كمدفعية ثقيلة ثلاث مراتٍ تقريباً بين شهري أيار/ مايو وآب/ أغسطس (112 حادثاً) مقارنةً ببداية العام (36 حادثاً). واقع الحال أنّ لبنان شهد في هذه الفترة ثلاثة اشتباكاتٍ رئيسية حدثت في عرسال بين حزب الله وجبهة الشام (النصرة سابقاً)، وفي رأس بعلبك بين الجيش اللبناني والدولة الإسلامية (لمزيدٍ من المعلومات حول رأس بعلبك، انظر الرسم البياني الثالثة أدناه)، وكذلك في عين الحلوة بين الفصائل الفلسطينية. أخيراً، تضاعف تقريباً خلال هذه الفترة عدد النزاعات المبلغ عنها والمرتبطة بالعنف القائم على النوع الاجتماعي (17 حادثاً) مقارنةً ببداية العام (10 حوادث). في الحقيقة، اكتشفت السلطات اللبنانية وفكّكت 6 شبكات دعارة في 4 شهورٍ فقط. ففي 27 أيار/ مايو، على سبيل المثال، اعتقلت الشرطة شبكة دعارةٍ وكذلك المهيمن عليها قرب منطقة ساحل علما. وكذلك في زحلة، جرى اعتقال أربعة أشخاص بتاريخ 22 حزيران/ يونيو بتهمة ارتباطهم بشبكة دعارة. وعلى الرغم من ذلك، من الأهمية بمكان الإشارة إلى أنّ الإبلاغ عن حوادث العنف القائم على النوع الاجتماعي لايزال ضئيلاً في لبنان، لاسيما تلك الحوادث المرتبطة بالعنف المنزلي والاعتداء الجنسي. من الممكن أن نقسم الأطراف الفاعلة الرئيسية الممسوحة إلى مجموعتين: أجهزة الدولة والمدنيين. تتضمن أجهزة الدولة الأطراف الأمنية الفاعلة للدولة مثل قوى الأمن الداخلي والجيش اللبناني والأمن العام وأمن الدولة، لكنّها تتضمن أيضاً أجهزة دولةٍ أجنبية كالجيش الإسرائيلي. واقع الأمر أنّ الجيش الإسرائيلي هو طرف الدولة الفاعل الأكثر فاعليةً والمشارك في ما لا يقلّ عن 531 حادثاً. تليه قوى الأمن الداخلي (357 حادثاً) والجيش اللبناني (202 حادثاً). أمّا المجموعة الثانية، فتتضمّن المدنيين/ اللاجئين كاللبنانيين والسوريين والفلسطينيين والمواطنين الأتراك من بين آخرين. وعلى غرار الشهور الأولى من العام 2017، ظلّ المواطنون اللبنانيون (524 حادثاً) الفاعل الأكثر مسحاً في المجموعة الثانية. لكن من المثير للاهتمام أنّ عدد الحوادث التي تضمّ مدنيين/ لاجئين سوريين (235 حادثاً) تزايد بصورةٍ ملحوظة بمعدل 34 بالمئة مقارنةً بالثلث الأول من العام (175 حادثاً). كذلك، فإنّ أكثر من نصف الحوادث التي تضمّ مدنيين/ لاجئين سوريين أُدرجت في فئة التوقيف/الاحتجاز. تسلّط هذه الأرقام الضوء على اتجاٍه عامٍ في المحافظة المتنامية على النظام والأمن، يستهدف السكان اللاجئين في لبنان، في سياق تهديداتٍ أمنية متصاعدة وخطابِ سياسي وإعلامي يجعل من اللاجئين كبش فداء. بالإضافة إلى ذلك، يقع 41 بالمئة من الحوادث التي تضمّ مدنيين/ لاجئين فلسطينيين في عين الحلوة التي شهدت تصاعداً في العنف أثناء شهر آب/ أغسطس، من خلال نزاعاتٍ مسلحة بين الفصائل الفلسطينية تتضمّن عمليات إطلاق نارٍ وتفجيرات ومدفعية ثقيلة. أخيراً، انخرطت مجموعاتٌ أخرى من الأطراف الفاعلة، من قبيل الأحزاب السياسية وكذلك الميليشيات والفصائل المسلحة، في نزاعاتٍ مختلفة في أرجاء لبنان. فعلى سبيل المثال، تضاعف عدد الحوادث التي تضمّ الدولة الإسلامية خلال هذه الفترة مقارنةً ببداية العام، مع حدوث غالبيتها في جرود عرسال ورأس بعلبك حيث تدير هذه المجموعات أعمالها. وعلى غرار بداية العام، كانت أعمال العنف الفردية (588 حادثاً) والنزاعات الحدودية مع إسرائيل (563 حادثاً) التصنيف الأولي الأكثر مسحاً خلال الثلث الثاني للعام 2017. بتسليط الضوء على أعمال العنف الفردية، نجد أنّ 34 بالمئة من هذه النزاعات تتصل بالتوقيفات (202 حادثاً) و17 بالمئة بالمشاجرات/ الخلافات (101 حادثاً)، تطور معظمها إلى إطلاق نار (76 حادثاً). يأتي هذا الاتجاه في سياقٍ أدانت فيه مجموعات المجتمع المدني وناشطوه الاستخدام الواسع النطاق للأسلحة. أمّا عدد الحوادث المصنّفة كنزاعاتٍ حدودية مع سوريا (286 حادثاً)، فقد تضاعف أكثر من ثلاث مرات بين شهري أيار/ مايو وآب/ أغسطس مقارنةً بالثلث الأول من العام 2017 (92 حادثاً). يمكن تفسير هذا الازدياد بالعمليات العديدة التي شنّها الجيش اللبناني على المقاتلين أثناء هذه الفترة. جرت إحدى هذه العمليات في نهاية شهر حزيران/ يونيو، عندما فجّر 5 جهاديين أنفسهم أثناء مداهماتٍ قام بها الجيش في عرسال، ما أدّى إلى تكثيف عمليات الجيش اللبناني في مخيمات اللاجئين السوريين. حقيقة الأمر أنّه جرى بعدئذٍ مسح 50 مداهمة أو توقيف تتصل بنزاعات الحدود السورية في شهري تموز/ يوليو وآب/ أغسطس. يظلّ هذا العدد من الحوادث أقلّ من 63 حادثاً مشابهاً سُجّل أثناء الفترة عينها في العام السابق بعد تفجير القاع أواخر حزيران/ يونيو 2016. يبقى حادث النزاع الحدودي الأبرز هو عملية "فجر الجرود" في جرود رأس بعلبك خلال شهر آب/ أغسطس، حيث شنّ الجيش اللبناني هجوماً يهدف إلى طرد مقاتلي الدولة الإسلامية من الأراضي اللبنانية (للمزيد حول رأس بعلبك، انظر الرسم البياني الثالثة أدناه). علاوةً على ذلك، شنّ حزب الله قبل ذلك في شهر تموز/ يوليو عمليةً مشابهة على جبهة الشام (النصرة سابقاً) في جرود عرسال. كذلك، صُنّف 82 بالمئة من نزاعات الحدود السورية كنزاعاتٍ على السلطة والحكم لأنّها ضمّت مجموعاتٍ مسلحة مثل الدولة الإسلامية وجبهة الشام شكّلت تهديداً لسلطة وحكم الدولة المركزية. ومن الجدير بالملاحظة أيضاً أنّ 23 حادثاً يتصل بالنزاعات الحدودية مع سوريا قد صُنّفت كذلك كنزاعاتٍ تتعلق بالتفرقة الاجتماعية مع مداهمات الجيش لأماكن استيطان اللاجئين، ما يتوافق مع اتجاهات بداية العام 2017 (22 حادثاً). وعلى الرغم من ذلك، فقد تركّزت هذه الحوادث في ثلاثة شهور: أيار/ مايو وحزيران/ يونيو وتموز/ يوليو. فضلاً عن ذلك، شهد الثلث الثاني من العام 2017 انخفاضاً ملحوظاً بمعدل 47 بالمئة في الحوادث المصنّفة كنزاعاتٍ سياسية، مع 109 حوادث بدلاً من 207 حوادث جرى مسحها بين شهري كانون الثاني/ يناير ونيسان/ أبريل. إنّ جميع النزاعات السياسية الممسوحة في الثلث الثاني من العام 2017 تتصل بالتحركات. واقع الأمر أنّ الثلث الأول من العام 2017 شهد ارتفاعاً في التحركات المتصلة بعددٍ من القوانين والإصلاحات والقرارات الصادرة في نهاية العام 2016، في حين يبدو الثلث الثاني من العام أكثر ثباتاً من حيث القرارات السياسية، ما قد يفسّر انخفاض النزاعات السياسية. وبينما تُظهر المادة البصرية أعلاه عدم وجود نزاعاتٍ تتعلق بالتنمية الاجتماعية السياسية ممسوحةٍ بوصفها تصنيفاً أوليا، فقد جرى فعلياً مسح 35 حادثاً تتعلق بالتنمية الاجتماعية السياسية بوصفها تصنيفاً ثانوياً. تُمثّل هذه الحوادث (35) 32 بالمئة من العدد الكلي للنزاعات السياسية. تُعدّ هذه الحوادث بصورةٍ أساسية تحركاتٍ تتضمّن احتجاج مدنيين على عدم دفع الأجور والبطالة والمنافسة غير النزيهة، لكنّها احتجاجٌ أيضاً على قراراتٍ عامة من قبيل إصلاحاتٍ قانونية تتعلق بالسياسات الضريبة وتلك الخاصة بالإيجارات. منذ اشتباكات العام 2014 في عرسال بين الجيش اللبناني وجماعاتٍ مقاتلة عابرة للحدود الوطنية، عمل مقاتلون مسلحون ينتمون إلى الدولة الإسلامية في جرود رأس بعلبك. ولأكثر من ثلاث سنوات، تطوّر النزاع وتصاعد في المنطقة الحدودية إلى معارك متكررة بين الدولة الإسلامية وتحالف الجيش اللبناني وحزب الله، وكذلك بين الدولة الإسلامية وجبهة الشام (النصرة سابقاً) التي أقامت معقلها في عرسال. وعلى الرغم من استمرار هذه المعارك منذ العام 2014، إلا أنّ الأمر اقتضى الانتظار حتى تموز/ يوليو 2017 لشنّ هجماتٍ على هذه المجموعات بهدف استعادة المناطق المحتلة. في الحقيقة، وبينما كان حزب الله يشنّ هجوماً في أواخر تموز/ يوليو على مقاتلي جبهة الشام في عرسال، كان الجيش يُعدّ هجوما على مواقع داعش في رأس بعلبك والقاع بهدف طردهم نهائياً من الأرض اللبنانية، وكذلك بهدف الحصول على معلوماتٍ عن مصير الجنود التسعة المتبقين الذين اختطفهم داعش أثناء اشتباكات عرسال في العام 2014 (للمزيد حول قضية الجنود المختطفين، انظر الجدول الزمني لعرسال). شُنّت هذه العملية التي أُطلق عليها اسم "فجر الجرود" رسمياً بتاريخ 19 آب/ أغسطس واستمرت 10 أيام. إلّا أنّ الجيش اللبناني كثّف على ما يبدو عملياته قبل أسابيع من الهجوم الفعلي. وفي حين تكرر قصف مواقع المقاتلين على نحوٍ متقطع منذ العام 2014، بدأ الجيش اللبناني بتعزيز مواقعه في جرود رأس بعلبك والقاع والانتشار بكثافةٍ حول المنطقة. في اليوم التالي، ذُكر أنّ المقاتلين المسلحين تعرضوا لقصفٍ مكثّف بالمدفعية الثقيلة والضربات الجوية، واستُخدمت القذائف الصاروخية. ردّ المقاتلون المسلحون على هذه الهجمات باستهداف مواقع الجيش اللبناني من دون إلحاق أيّ إصاباتٍ بين جنوده. وفي الثالث من آب/ أغسطس، بعد خمسة أيامٍ من الاشتباكات المتقطعة، بدأ الجيش انتشاراً جديداً حول عرسال بالقرب من منطقة رأس بعلبك. كما أنّ هذا الانتشار جاء بعد انسحاب مقاتلي جبهة الشام من المنطقة في أعقاب هجوم حزب الله. وفي اليوم عينه، تجدّدت اشتباكاتٌ عنيفةٌ في رأس بعلبك والقاع وعرسال، وانتهت بعد خمسة أيامٍ بعد تمكّن الجيش من تدمير عددٍ من تحصينات وآليات مقاتلي الدولة الإسلامية وإلحاق إصاباتٍ كثيرة بين صفوفهم. أثناء هذه الهجمات، تمكّن الجيش أيضاً من إحكام السيطرة على تلالٍ استراتيجية تُشرف على مواقع الدولة الإسلامية، الأمر الذي لعب دوراً تكتيكياً أثناء المعركة الأخيرة الوشيكة. وفي غضون ذلك، جرت مداهماتٌ في مخيمات اللاجئين في عرسال اعتُقل فيها من يشتبه بارتباطه بداعش. وبعد ذلك، تواصل شنّ هجماتٍ متوالية لعدة أيام مع قصف الجيش لمواقع المقاتلين واستعادة الأراضي التي احتلتها الدولة الإسلامية. يمكن النظر إلى كافة هذه الأحداث بوصفها تحضيراً لعملية "فجر الجرود" التي هدفت إلى طرد الدولة الإسلامية بالكامل من لبنان. من وجهة نظرٍ جيوسياسية، تزامنت هذه المعركة على الدولة الإسلامية مع هجماتٍ موازية شنّها حزب الله والجيش السوري في القلمون، على الجانب السوري. في التاسع عشر من آب/ أغسطس، بدأ رسمياً إجلاء المقاتلين مع شنّ الجيش هجوماً على مواقعهم في جرود رأس بعلبك والقاع، ولاحقاً تحرير الأراضي التي احتلها داعش. انقسمت هذه العملية إلى أربع مراحل واستمرت لعشرة أيام. تضمّنت المرحلتان الأولى والثانية أساساً القصف المكثّف للجماعات المقاتلة بالمدفعية الثقيلة والاستيلاء على الأراضي المحتلة. كذلك، بدأت وحدات الجيش بعد انفجار لغمٍ تركه داعش أسفر عن مقتل ثلاثة جنود في اليوم الأول بمسح المناطق المزروعة بالألغام والعبوات الناسفة بغرض تمهيد الطريق لخط جبهة الجيش اللبناني. نتيجةً لذلك، تمكّن الجيش من إحباط عدة هجماتٍ انتحارية لداعش وكذلك من تفكيك عددٍ من الألغام التي خلّفتها الجماعة. مع انتهاء هاتين المرحلتين، انتشرت وحدات الجيش في عكار والمناطق المحيطة المحاذية للحدود بغرض منع المقاتلين من الفرار إلى مناطق أخرى، في حين اعتقلت وحدة الاستخبارات أحد ضباط أمن داعش. بعد هذه الإجراءات الوقائية، كانت المرحلة الثالثة من العملية جاهزةً للإطلاق في اليوم الرابع من المعركة وأتاحت الاستيلاء على المعاقل الاستراتيجية التي تسيطر عليها الدولة الإسلامية وكذلك على كمياتٍ كبيرة من الأسلحة والذخائر والعبوات الناسفة التي تركها المقاتلون. في اليوم السادس من القتال، بدأ الجيش بالتحضير للمرحلة الأخيرة من العملية بإعادة تنظيم مواقعه في المنطقة. وفي اليوم الثامن، تسبّب هجومٌ لداعش على آليةٍ للجيش بست إصاباتٍ بين الجنود اللبنانيين. في غضون ذلك، واصلت وحدات الجيش اللبناني قصف المواقع المتبقية للمقاتلين إلى أن تمّ التوصل إلى وقفٍ لإطلاق النار مع الجماعة مقابل الجنود المخطوفين. وعلى الرغم من النصر الواضح للجيش اللبناني على هذه الجماعات، انتهت هذه المعركة على نحوٍ يتسم بالمرارة مع الإعلان عن وفاة الجنود المخطوفين الذين قتلهم خاطفوهم على ما يبدو منذ سنوات. استعادت السلطات اللبنانية رفاتهم من موقعٍ قرب الحدود السورية. أخيراً، أكمل الجيش في اليوم العاشر انتشاره في المنطقة المحتلة سابقاً وأنهى المعركة رسمياً، في حين واصلت أفواج الجيش المتخصصة إزالة الألغام والعبوات الناسفة الأخرى من هذه الأراضي. شهد قضاء صور الكثافة الأعلى للنزاع المسلح في النصف الأول من العام 2017 بمجموع 93 حادثاً. يتصل 97 بالمئة من هذه الحوادث بالنزاع الحدودي مع إسرائيل وصُنّف 96 بالمئة منها كانتهاكاتٍ للحدود البحرية من قبل الجيش الإسرائيلي. اقرأ المزيد. وعلى الرغم من أنّ الحوادث في بُعد التحرك قد انتشرت في أرجاء البلد خلال النصف الأول من العام 2017، إلّا أنّ بيروت شهدت الكثافة الأعلى في هذا البُعد بـ 31 بالمئة من حوادث تقع ضمن بُعد التحرك . فضلاً عن ذلك، صُنّفت غالبية حوادث التحرك الممسوحة في بيروت كنزاعاتٍ سياسية تتصل من بين أمورٍ أخرى بالانتخابات النيابية وقانون الإيجارات ورفع الضرائب. علاوةً على ذلك، في بيروت، صُنّف 25 بالمئة من الحوادث في هذا البُعد إمّا كنزاعاتٍ تتعلق بالتفرقة الاجتماعية أو كنزاعاتٍ تتعلق بالتنمية الاجتماعية الاقتصادية. اقرأ المزيد. استكشف كافة خرائط مؤشر الحالة النزاعية والتصديرات للنصف الأول من العام 2017 هنا.